We’ve been busy in our development lab, improving premium user interfaces and games on VocabularySpellingCity. We visited classrooms, introducing educators and students to the changes, and observed them interacting with the site. This research has enabled us to develop our most user-friendly interfaces yet, making our site more effective, engaging, and entertaining. We’re excited to announce some new and improved features coming soon for Premium Members to help streamline your experience. Instead of using the Toolbox in the upper right corner to get from page to page, you will now easily navigate using the new menu bar across the top of every page. The links to Teaching Resources and the Search pages that used to be in the menu bar can now be found under List Management. They can also be found at the bottom of every page. Grading & Records will take the place of Test Results and Writing. 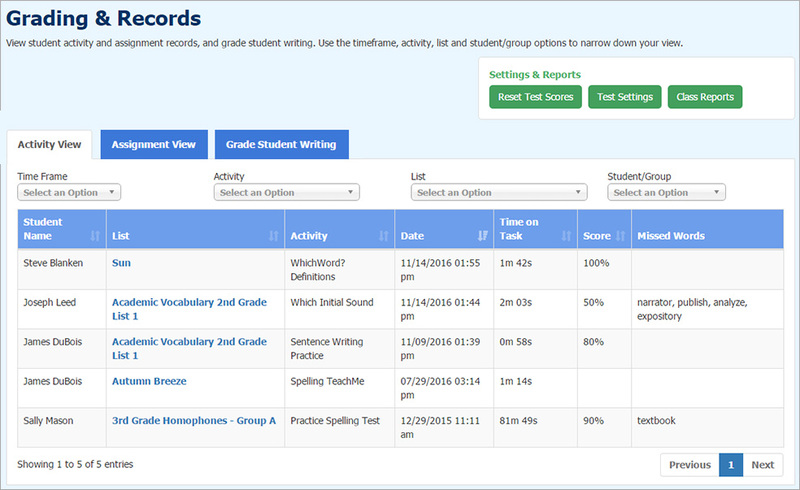 You will now find your students’ test scores and writing activities by selecting Grading & Records from the menu bar. Here, you will see an overview of all student activity, or filter information by timeframe, activity, list, student or group. You can also view assignment progress, as well as grade your students’ writing. My Students, where you have found all student activity, will be a page dedicated to simply managing student accounts. Class Reports, accessible from both the Grading & Records and the My Students pages, will allow you to view, download and print student averages, class summaries, graded tests, and more. It also provides the option to download your students’ test scores in the same format that “Test Results” in your Toolbox provided. 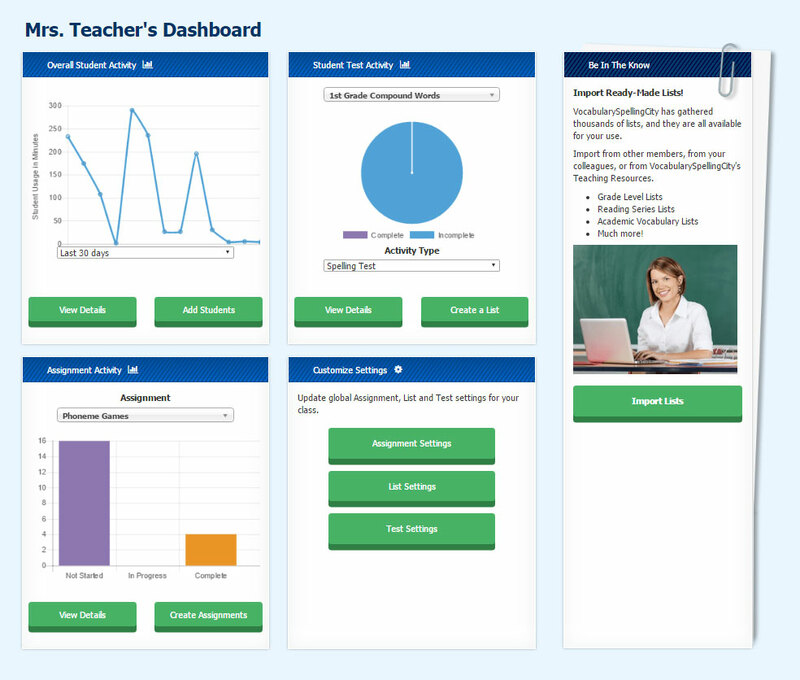 The redesigned Teacher Dashboard keeps important features, such as creating assignments and accessing reports, immediately accessible for Premium Members. 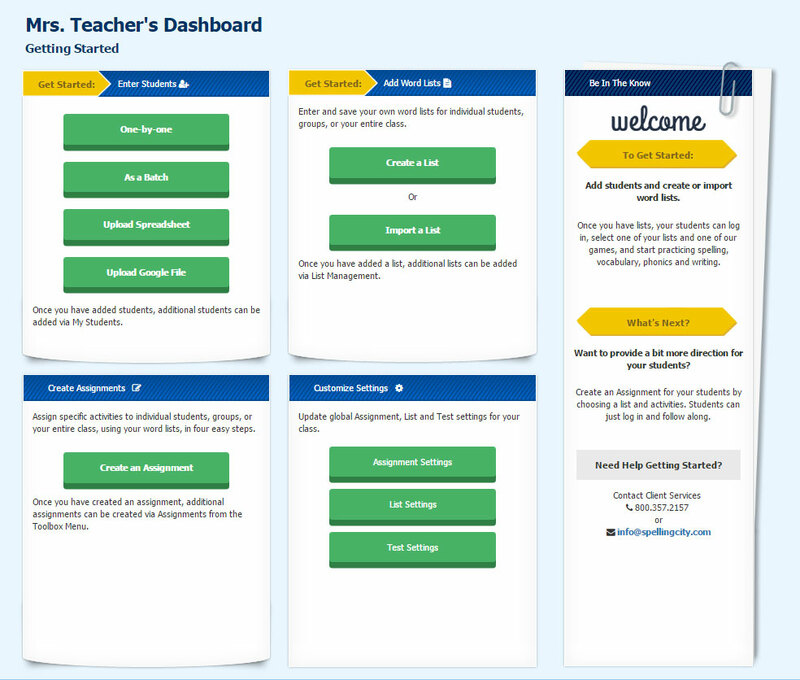 When teachers first log in, they will see the Getting Started dashboard. This dashboard makes it easy to add students, import or create lists, create assignments, and customize settings. This is the Dashboard view teachers will have after they’ve entered their students, imported or created lists, and created assignments. The Dashboard will now show real-time data on tests and overall student activity. 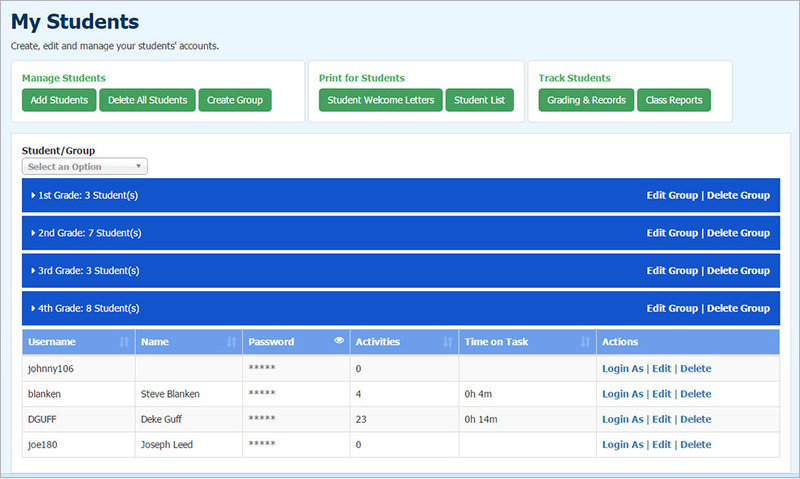 Teachers can continue to add students, import or create lists, create assignments, view reports and customize settings. Updates, helpful hints, and new ideas for using our site will be posted so teachers are always informed of our latest features. Students can easily navigate using large, colorful graphics and buttons, instead of text links, in a theme of their own choosing. Quick links provide students with access to all of the features available to them, including assignments created by their teachers or parents. Students will also be able to easily view high scores or replay favorite activities, using the “Recent Activity” block. Students can navigate easily from lists to their favorite learning games and activities. Students can create and save their own word lists, once the teacher or parent has activated this feature. Students can track their own progress on activities or assignments.